Commissioned by the Piedmont Community Church. 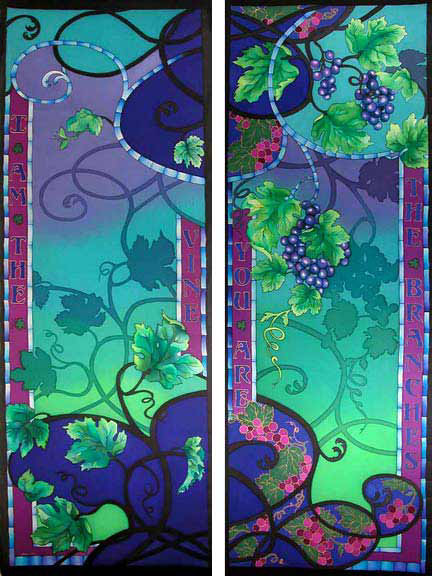 Concept: The clients banner committee requested an Art Nouveux style design that complimented the stain glass windows in the church. 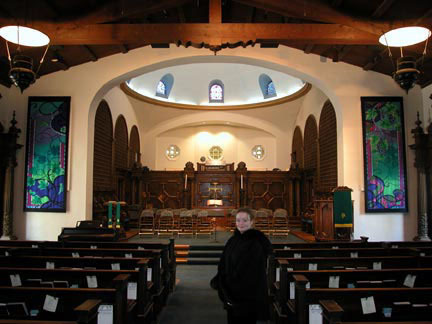 A sketch of the design was executed in proportion to the required finished size. A small color sample was painted on silk. The sample design and color sketch was presented to the committee for approval. A blueprint of the design was made to size. The blueprint was securely taped onto a flat white surface. The text (I am the Vine, You are the Branches) was printed out to size from the computer. The text was designed in the banner boarder on the blueprint. The silk was stretch and tape onto the blueprint. 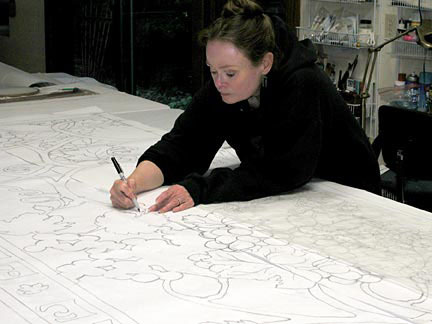 The design was trace onto the silk with a sharp pencil. (The pencil marks are covered by the decorative resist.) French Curves were used as guides for the large curves. 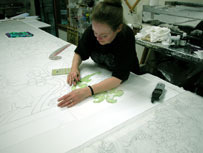 Once the design was transferred onto the silk, the silk was remove from the blueprint. 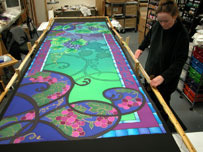 The silk banner was then stretch onto Moyer Design Fabric Stretcher. A support bar (Moyer Design Fabric Stretcher bar) was placed across the stretcher to lean on and steady my hand while applying the resist. After the decorative resist dried the silk was removed from the fabric stretcher. Using a pressing cloth, the decorative resist was iron-set into the silk to set the resist. 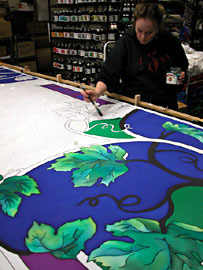 The silk banner was then re-stretched onto the Moyer Design Fabric Stretcher System. To test the resist for leaks water was applied with a brush within the resisted areas. The few leaks that became apparent where marked with a small piece of masking tape. Once the silk dried the leaking areas were carefully reinforced on the back of dry silk with clear gutta. All the colors used in the banner were pre-mixed to match the sample. My assistant helped paint the background in a graduated blend of color. The background dye was allowed to dry and then clear gutta resist was used to draw in the outline for the background shadows and shapes. It took more than three weeks to complete painting the banners. How to prepare and roll banners, wall hangings and yards of fabric for the steam fixation. Steam fixation is the process that sets the dyes and renders the silk hand-washable. If not done correctly, the silk can become stained by condensation, burned by lack of water in the steamer, or possibly permanently wrinkled if it was not rolled properly before it was placed in the steamer. The following steps will help to minimize the possibility of creating permanent wrinkles in the silk, especially when steaming yards of fabric or a long banner. Working with an assistant will make the job easier, since paper will stick to the decorative resist (black, gold. silver etc.) and it is next to impossible to remove it. The silk should be rolled for steaming between sheets of fabric. I use freshly washed old cotton or cotton polyester sheets that can be rewashed and reused. 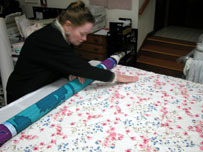 After the selvages have been removed, the width of the fabric sheets should be at least 4 wider than the silk. Prepare enough fabric sheeting to cover the length of the silk with two layers of sheeting 6 inches longer than the silk. Cut two lengths of newsprint paper 2 feet longer than the length of the silk. The additional length becomes the protection for outside of the rolled silk. The silk is the first layer. NOTE: The newsprint paper should extend 1 1/2 -2 feet beyond the layer of silk and fabric sheeting. Carefully roll the layers around the steamer core. 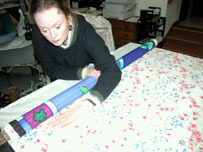 If the layers are in the correct order you will see the silk painting on the outside of the roll. Seeing the silk gives you the opportunity to prevent wrinkles. Constantly smooth out the silk as you roll and brush your hand over the layers and away from the roll. While rolling the silk, keep even pressure and make sure the edges of the silk, sheeting, and the paper are as lined up as possible. If there is not enough paper at the end of the roll to go around the silk, add more paper. 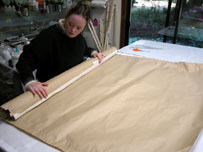 Cut a piece of brown uncoated craft paper into 55 wide x 48-50 (craft paper needs to be wider than the rolled silk bundle). 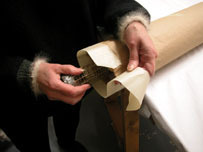 Roll the craft paper around the bundle of rolled silk. Secure the craft paper around the roll by staggering six or so pieces of masking tape along the edge. Secure the ends of the roll with 2 wide masking tape. Place one half the width of the tape around the edge of the roll and pinch the other half onto the core so it seals the ends. Secure the tape onto the core with a rubber band at each end. 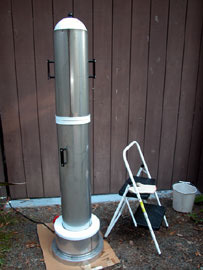 Place the roll into the fabric steamer. To prevent condensation from collecting and water staining the silk, center the rolled bundle in the steamer. Also make sure the rolled bundle is securely suspended several inches above the water level and does not rest on the sides of the fabric steamer. Steam for 3-3 1/2 hours. Check on the water level a few times. Once steam set, remove the silk from the roll and lay it flat. Let it air for a few hours. Storing the banners like you would a quilt, roll front side up in a clean cotton sheet. Silk needs to breathe so do not store the banners in plastic. If or when needed wash one banner at a time in a bathroom tub filled with tepid water (not hot) and a little ivory liquid or mild soap (dont use Woolite). Do not wring or twist. 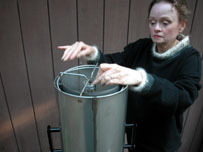 Rinse two or three times in a tub full of clean water. In the last rinse use a few tablespoons of white vinegar. The vinegar creates an acid PH that brings up the natural luster of the silk. Lay the banners flat on clean towels to dry. Steam iron the banners using a pressing cloth. Here the silk has been stretched and taped onto the blueprint. 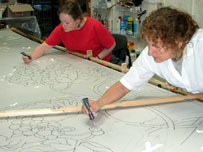 Susan and Barbara Jenkins are tracing Susans design onto the silk. French Curves were used as guides for the large curves. The sample design color sketch is in the foreground. and then stretch onto Moyer Design Fabric Stretcher. 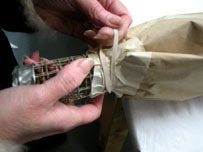 Masking tape was placed on parts of the design to provide guides so Susan and Merridee would know which resist lines are to be black and which are not. a Moyer Design Fabric Stretcher bar to lean on and steady their hand. Susan is painting the flat negative spaces. 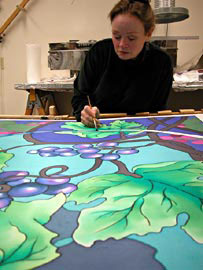 Susan is painting the details in the leaves and grapes. 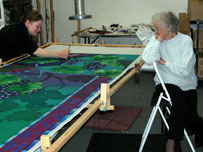 The last details on one of the banners are being completed as Susans mother looks on. Banner You are the Branches is being removed from the Moyer Design Fabric Stretcher. 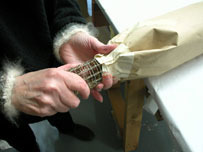 The layers of silk and sheeting are being carefully rolled around the steamer core. 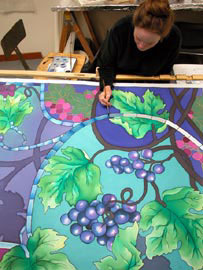 When the layers are in the correct order, as you see here, the silk painting will be on the outside of the roll. Seeing the silk gives Susan the opportunity to prevent wrinkles. 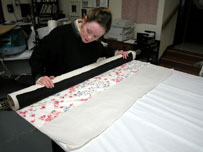 As the layers are rolled, Susan constantly smoothes out the silk by brushing her hand over the layers pushing any lumps or wrinkles out and away from the roll. While rolling the silk, she keeps even pressure and makes sure the edges of the silk, sheeting, and the paper are as lined up as possible. As seen here, the newsprint paper should extend at least 18 beyond the layer of silk and fabric sheeting. Keep rolling to the end and then secure the roll with 6or more small pieces of masking tape. For additional protection against condensation, the rolled silk is covered with a piece of uncoated brown craft paper. In this case, 55 wide craft paper is secured around the roll by staggering six or so pieces of masking tape along the edge. Secure the ends of the roll with 2 wide masking tape. Place one half the width of the tape around the edge of the craft paper. Pinch the other half onto the core sealing the ends. Secure the tape onto the core with a rubber band at each end. 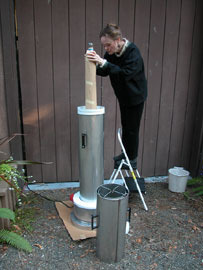 Place the bottom section of the fabric steamer onto the base. To prevent condensation from collecting and water from staining the silk, center the rolled bundle over the center hump of the quadrangle. The quadrangle is the part attached to the bottom of the steamer. Make sure the rolled bundle is securely suspended several inches above the water level. Steam for 3-3 1/2 hours. 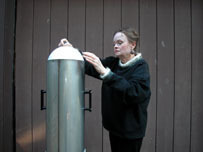 Susan has not had to add water to this steamer but if this is your first time, check the water level at least once during the steaming. Once you are sure the roll is securely placed between the bottom and top quadrangles and does not rest on the sides of the fabric steamer, put the lid on the steamer.